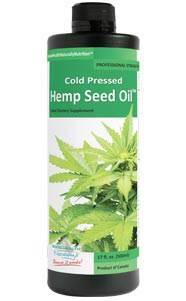 Hemp Oil - King Of Them All! Hemp is unique with an almost perfectly balanced profile of Omega 3 & 6 and 9 fatty acids from cold-pressed organic hemp. Unique among common seed oil, it also contains GLA, and even more unique, it is able to raise circulating GLA. The Essential Fatty Acids in hemp are renowned for their potential health abilities. Extensive studies have shown that many common illnesses are related to deficiencies or imbalances of specific fatty acids in the body in particular, Omega 3, 9 & 6, of which Hemp oil can provide and is very high in these fatty acids. Only Hemp Oil can be massaged into the skin and absorb into the blood, which is excellent for children or those unable to take by mouth. * Based on 2000 calorie diet.